WMT has a 4,500 site network covering over 90% of the US population. Its stores – most with enormous re-deployable space and easy accessibility – and, increasingly, its websites, are fixtures into the weekly routine of many (especially older) Americans. So far, however, its healthcare experience has been mixed. Clinics have been a disappointment, handicapped by a combination of excessive ambition, poor strategy and erratic commitment (see note at the end). At this point, Wal-Mart owns clinics in just 19 publicized locations and a shrinking number of leased sites. On the other hand, pharmacy performance has been strong. One key factor behind that success has been a long-term partnership with HUM including a joint narrow network Medicare PDP product with 2.4M members. Multiple collaborations since the alliance launch have built a strong overlap of customers: more than half of HUM’s Medicare Advantage (MA) lives are in counties which have above average per capita WMT store density, a much larger share than other major plans (see exhibit where width of the columns represents the plans’ share of MA lives and vertical bars show how each plan’s lives are allocated based on WMT network density in their county). In addition, WMT is a major innovator in healthcare procurement for its own employees — especially regarding national Centers of Excellence. Since 2012, WMT employees can go to selected top providers in the country for cardiac, spine, knee and hip surgery and oncology. As a largely mono-line insurer with a nationally distributed membership, HUM uses two approaches to mitigate its lack of the scale and local density of competitors. First, HUM cultivates strong member relations with direct marketing (honed through years of competing against the more widely recognized Blues and AARP brands) and an obsessive, metrics-driven culture of consumer experience excellence. The resulting trusting member relationships support retention as well as high scores on the patient experience portion of Medicare Advantage (MA) Stars ratings. Second, HUM makes it easy and rewarding to partner on value. This is reflected in wellness, where the Humana Vitality makes heavy use of points, ecosystem integration (e.g. fitness trackers) and brand-borrowing to create engagement (Humana Vitality). More importantly, it is also reflected in its approach to providers: HUM combines rewarding value-based contracting with enablement (e.g. 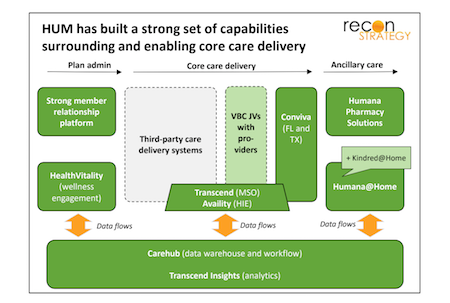 Carehub data warehouse, Transcend analytics), integration (HIEs) and coordinated ancillary care to make it easy and attractive for providers to partner on Stars, risk adjustment and value. HUM ownership of ancillary care where competitive scale is achievable (PBM, Humana@Home now enhanced with the Kindred acquisition) enables tight focus on HUM’s care management strategy, full exploitation of and more touch points with members to reinforce that trusting relationship. The model of surrounding third party providers with a supporting ecosystem can work well, as long as there are third party providers not distracted by being part of big systems with their own agenda or by super-scaled health plans insisting on more attention to their needs or just buying them up altogether. Convergence raises the specter of this vulnerability. HUM has been investing in provider clinics in FL and now carefully expanding to other markets where it has a critical mass of lives (TX) under the branding Conviva. The pacing has been cautious (not unexpected given the Concentra misstep, the fear of competing with provider partners and the challenge of competing with other acquirers) and HUM’s current system of 195 Conviva sites is a long way from being able to support their plan members. Given these starting points, what might WMT and HUM do together? First, bulk up HUM’s commercial book by gradually transitioning WMT lives to HUM administration (pacing the transition to ensure HUM gains from the incremental rate leverage – and that WMT does not lose – and allowing HUM to scale up commercial capabilities as needed). The added heft will increase HUM’s leverage vs. third party providers (having commercial rates – not just Stars and risk adjustment bonuses to attract attention) and a platform for turning around its commercial and TPA business. Second, expand WMT clinic presence to a national network using HUM’s MA lives, WMT employees and, perhaps, Medicare FFS patients who get their drugs from WMT to provide a critical mass of patients. HUM can continue to grow Conviva hub clinic locations outside of the stores to avoid pigeon-holing in the minds of consumers, but the stores provide foot traffic, overhead sharing and, above all, ready-to-go locations. Building more or less from scratch allows the care delivery system to exploit the latest in teaming models (plenty of physician extenders) and technology (esp. telemedicine). Third, embed WMT’s Center of Excellence models into HUM health plans. Even if the current impact of these models is not material (something I doubt), they can blunt the pain of narrow networks (with access to nationally recognized brands) and high deductible designs (by offering rich coverage if the Center of Excellence path is chosen). As clinical strategies increasingly shift towards precision medicine, there is an argument that Center of Excellences will become increasingly part of diagnostics and treatment recommendations and a HUM product can be ahead of the curve. Conviva could also structure its clinical model to provide coordinated care before and after the Center of Excellence episode, reducing further the frictions of medical tourism. Finally, selectively expand ambulatory care capabilities in rural markets to ensure alternatives are available. Rural markets are known to be WMT strongholds but also regions of provider shortage with healthcare economics trends reducing that availability further. At the same time, the art of the possible in ambulatory or low-acuity locations (e.g. micro-hospitals) is growing. WMT could be well positioned to fill the in the gap by selectively expand services (infusions, ASCs, etc.) to either fill gaps or create alternatives if the local provider system lacks competition. By putting all this in place, HUM would be much better positioned to defend its existing business vs. other emerging convergence models and provider consolidation, reinvigorate its declining commercial business with additional scale (e.g. in pharmacy) and a very differentiated offering, and, finally, obtain enhanced relationships with the leading provider systems in the country. WMT would have a national healthcare delivery business, further enhance the destination value of its stores, and many more touchpoints to build consumer relationships. That’s a lot of equity value. Hard to see how to accomplish all that in an alliance, easier to see how an acquisition would be best. Of course, I am not sure how well this scenario reflects WMT-HUM’s thinking but (to paraphrase the historian Michael Howard) the purpose of scenario planning is not to get the future right, but to prevent strategy from being terribly wrong. At a minimum, WMT-HUM has an option to mitigate CVS-AET integration plays or counter UNH if it starts taking active steps to use OptumCare to preferentially advance its plan business. The strategy of local consolidation and system building around hospital anchors is already facing the OptumCare threat (hollowing out tertiary inpatient economics). If WMT-HUM pursue the proposed scenario, provider systems will face another ambulatory-based competitor potentially going after some of the same economics. Besides attacking the tertiary inpatient “flanks”, WMT-HUM could also create a threat “from above” to complex care: national-grade competition. Center of Excellence strategies offer an arbitrage on the wide variability of care quality. Local consolidation can reduce variability in clinical practice but not necessarily to a better average set of outcomes. Transparency and cost sharing will encourage patients to ask more questions. The science is progressing too fast for everyone to keep up and technology is reducing the friction of distance. It may not be WMT-HUM, but someone is going to figure out how to make this work and the right model to get consumers to accept it. 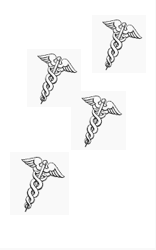 HUM’s moribund commercial business could see a renaissance with better rates (thanks to leverage from incremental WMT employees), a network geared towards store clinics and physician extender teams, and a Center of Excellence differentiation (hard for competitors to replicate because of second-order effects on network relationships). Finally, this scenario does not necessarily put WMT-HUM on a collision course with AMZN. AMZN’s best long-term play is to create better performing healthcare markets. This WMT-HUM model could plug in nicely to either the healthcare Orbitz (B2C) or healthcare Alibaba (B2B) models for AMZN’s plays. When two potential entrants as savvy and well-resourced as AMZN and WMT can play well together, watch out! Tory Wolff is managing partner at Recon Strategy.